Tyrese McKie has a mission: increasing African-American families’ engagement in their South Los Angeles schools. 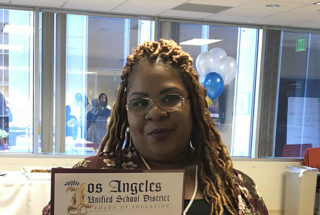 She joined the L.A. Unified Board District 5’s Family Problem-Solving Group in October to help boost the number of African-American parents who are actively engaged at Jefferson High School, Carver Middle School, Nava College Preparatory Academy and Holmes Avenue Elementary, which serve the highest percentage of African-American students in District 5 schools. McKie, whose daughter is a 10th-grader at Nava, found that black parents wanted to show support for their children, but their main barrier to being more engaged in their education was that often the only contact they have with their children’s school is when there are negative reports about their children. “This was about parents like me: Parents who are tired of getting calls from school just to share negative things about your child. Parents tired of feeling that our culture is not celebrated but tolerated,” she said as she and other parents in the group presented their suggestions to L.A. Unified officials in December. The parents presented data showing that blacks were the student group with the most negative school experience, based on their responses to the L.A. Unified School Experience Survey in 2016. When asked if they were being treated with respect by teachers, 80 percent of black students at the elementary level said their experience was mostly negative. The vast majority of white and Asian students had the opposite response to the same question: over 90 percent of them agreed their experience was mostly positive. There are about 38,500 black students in L.A. Unified, making up 7.7 percent of district enrollment. This year their graduation rate rose to 76 percent, higher than the district’s average of 73.6 percent, but their state test scores continued to lag district averages. On the state tests, 31.7 percent of blacks met or exceeded reading standards, compared to 42 percent for all L.A. Unified, and 20 percent met math standards, compared to 32 percent districtwide. Board District 5 started the Family Problem-Solving Groups last year to provide a framework to guide parents through a process that supports their identification of pressing issues and development of workable solutions. The board office staff facilitates problem-solving meetings and provides parents with resources including data, strategic support and advocacy tools. 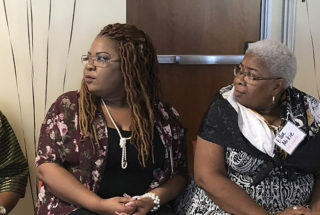 Tyrese McKie and her mother, Ella McKie, are members of L.A. Unified Board District 5’s Family Problem-Solving Group and presented their group plan to boost African-American family engagement to district officials on Dec. 17. During the meeting, two district officials committed to supporting the parents’ plan, which recommends evaluating the school experience survey results to identify types of mentorship programs that can be tailored specifically for black students and identifying funding sources. “We’re not only welcoming the plan, but we really want to continue hearing from you about your needs, and how we can work together to close the (achievement) gap that exists among African-American students. That gap is not only not closing but growing. We want you to help us think of all the different ways we can solve that and how we can best reach out to our families,” Hilda Maldonado, L.A. Unified’s senior executive director of diversity and instruction, told the parents during the presentation held at the downtown office of the United Way of Greater Los Angeles. Maldonado said this type of community input is what Superintendent Austin Beutner’s Reimagining Our Schools plan is all about. “We know that the community collective, advocates and families are the ones who best understand the solutions,” she said. The release of the plan has been delayed by the Los Angeles teacher strike. McKie, a single mom, said she has started to volunteer as a mentor at Nava, where she has been able to be “an ally” for parents and teachers in helping black students succeed. Her hope is that other parents and district officials will join her in that effort. What did you learn through the Family Problem-Solving Group? These families have two or three children or more and have to deal with balancing their time between work, babysitting and having to make time to participate in school. It’s not easy. Time is an issue, but also parents need to know what’s happening in school with their kids so they know what kind of support they need, and much of it is just emotional support. It’s not that parents don’t want to come, it’s that they have different challenges. If you want to get parents involved, you start with their kids. If you start with the kids, the parents can see the positive change, then they want to come along. That’s the best way to involve the parents. Mentorship programs are a good way to involve parents. Also, the school should know that not all of us are the same. I come to the school and they ask me about another African-American student. Just because of the color of our skin, they think we’re all the same. But every child is different, every family is different, we have different needs. Schools must know our different situations. They need to look at us individually. Why does family engagement matter to students? If parents get more involved, if they show their face in school, they can better advocate for their child to be in the right program, receive the right support, find out if there’s an issue with the teacher. They may be gifted! If parents get involved, they will know if their kid is really acting up or maybe is in the wrong program. Kids need their attention. They need to get to know the teacher, they need to know what their kids’ real situation is in the classroom. And you only know that if you are there.